Jonathan Abel-Millman (left) and crew in a storm off Norfolk. Jonathan grew up sailing around Cape Cod and on small lakes in Pennsylvania. His passion for sailing led him to study Naval Architecture at the University of Michigan. He raced four seasons out of Annapolis, MD on a Humphreys 38, doing mainly bow. Last June he did a delivery of a C&C 38 from Bermuda to Annapolis, MD. 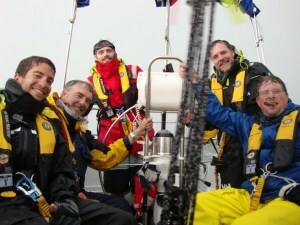 (The picture show the crew after they hit a large storm several miles off Norfolk, VA. Jonathan is on the left). In 2008, he raced in the 2008 Annapolis Race week on a J24, and this fall crewed on a Santana 20 on Lake Pleasant and the Fireball on TTL. Jonathan is interested in doing more Blue Water and Coastal long distance races. Susan has lived in AZ since the age of 5, considered somewhat a native. She lives within minutes of Tempe Town Lake and enjoys the sailing activities there. She’s new to sailing: She took Start Sailing Right in the Fall of 2009 and Sailing Skills Development in Fall 2011. She sailed a Sunfish during that course and is interested in adopting a Sunfish. In November 2012, she crewed at Lake Pleasant and also enjoyed meeting all the ladies that sail at their first “Ladies’ Sailing Gathering.” Her current interests are to become more involved in crewing races, the Ladies’ Sailing Group, and taking additional classes. Kurt raced dingies for 52 years and loved every moment of it! He raced Thistles for the last 30 years along with Lightnings and Fireballs. He still owns his Lightning and an Arrow iceboat. His current “dinghy” is a Soling keel boat. He says that although they’re now out of favor at the international level, they’re the best sailboat he’s ever sailed! Kurt hopes he can build a fleet here for one-design racing. Kathy and Kurt met crewing on a Lightning 30 years ago. They started cruising a few years later on a Tartan 30. She prefers cruising to racing but is still good for potluck regatta cooking. They purchased a Crealock 37 seventeen years ago and sailed it from south Florida to the Great Lakes, spending years on Lake Erie, Lake Huron, and now on Lake Superior. They will split their time between Bayfield, Wisconsin, at the Apostle Islands, and Cave Creek and Lake Pleasant. Kat Malinsky and Ruby Whelan recently moved to Scottsdale from St. Petersburg, Florida. Kat has been sailing since she was 12 years old. Starting out on a Sunfish on Long Island Sound, she graduated to a Cal 25 on Tampa Bay as an adult. Then Kat and Ruby bought an Ericson 29 together to cruise the Tampa Bay area. Kat went on to complete her Coast Guard Captain’s License and Ruby soon discovered that she was a day sailor who preferred to have crew along for the trip! So Kat downsized to a Catalina 22 that she could single-hand. Moving to Arizona has shifted Kat’s interests to racing. She’s looking forward to crewing on Hot Flash, Dianna Andress’ Santana 20, this spring series.